This distinctively decorated flower girl basket has both function and style. 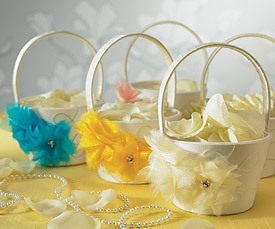 The "feathered" organza floral and coordinating swirls give this basket a modern and distinctive look. Plan to combine with other coordinating components available in this collection to give your wedding a cohesive look. Available in five fashionable wedding colors.